Katherine of Aragon - the Beloved Queen. | Wendy J. Dunn, Award-Winning Author. She was born in winter, when yet another year concluded for her mother’s Holy War – a crusade forcing out her country’s Moors . The last and fifth child of two reigning monarchs, Isabel of Castile and Ferdinand of Aragon, Catalina of Aragon deeply loved and revered her mother, one of the strongest queens ever known to history. In England, later events proved Catalina very much her mother’s daughter. Yet – the history changing measures enforced by her mother, when her children witnessed long seasons of war and conquest, a land often rent by a constant state of change, were lessons she never forgot. In many ways, she proved herself a wiser and nobler woman than Isabel. Her parents decided, signed and sealed her life before her third birthday, agreeing to wed her to another infant, Arthur Tudor, Prince of Wales, the first-born son of a new English royal family and the heir to England’s throne. Thirteen years after the first negotiations, at only fifteen, Catalina journeyed overland from Granada to the seaports of Corunna. Ships waited there to take her to England, where she would marry Arthur, now fifteen-year-old. The dangerous journey across Castile took Catalina months. Her mother, ill and broken by grief, couldn’t bear accompanying her youngest child for any part of the journey. With her other daughters, she made a habit of going far with them, personally handing them over to their new lives with joy. But her joy within months turned into grief. By the time her youngest child left her side, death sliced the number of her children from five to three. Her only son died at nineteen. Loved and doted on, his death cast a dark shadow on all his parents’ hopes for a unified Castilla and Aragon. Shortly after his death, Isabel’s eldest daughter died in childbirth, after going to a marriage she tried her best for years to avoid. With Catalina, Queen Isabel kept her by her side as long as she could, giving excuses to the English for all the delays. Finally, the Queen could delay no more. Catalina left her mother’s arms for the last time in Granada. They both knew they would never see one another again in life. Coming to England from Castile meant braving a treacherous sea crossing. Storms forced Catalina’s ships back the first time; the second attempt was worst, except the hurricanes finally managed, after many times blowing Catalina’s ship away from England’s shores, to bring her ship safe into a English harbour. One the first things Katherine (the name we know her best as) was to go to a church and give thanks for surviving. She feared then about her future. Future events proved her right. Already, grief had interwoven thickly its dark threads in Katherine of Aragon’s life; in England, this weave continued its criss-cross to the very end. In modern society, we take for granted the fact our children are more than likely to reach adulthood. The advances in medical knowledge have gifted us with the expectation that our children will out-live us. We face childbirth knowing the great likelihood of a happy outcome; women no longer ready themselves for the possibility of death when they give birth. Far too many times, childbirth meant death for mother or child in the fifteenth or sixteenth centuries, sometimes both. For people then, death was almost a daily companion. Times were hard and living a daily proposition. Despite their greater experience of death in the fifteenth and sixteenth centuries, losing loved ones still struck people to the quick. When Katherine’s eldest sister lost her husband, Alfonso, prince of Portugal, in a riding accident, she cut her hair off, locked herself away in a dark room, refused to eat or sleep. Her parents brought their daughter home, but young Isabel never stopped grieving. Isabel of Castile and Fernando of Aragon gave their eldest child five years of widowhood – then made another marriage for her, this time to Alfonso’s kinsman, now King of Portugal. Isabel only went through the motions; giving birth to a son she let go of life. It broke her parent’s hearts when this same baby died in his grandmother’s arms less than two years later. When Katherine came to marry Arthur Tudor she already bore this cross of grief. But her belief in God and the world to come kept her going forward. Katherine’s cross of grief grew heavier in England. Her marriage to Arthur, celebrated with such hope and joy, lasted only short months. He succumbed to one of the many illnesses that struck hard and fast in these times, and so often took young lives. Within short months, Katherine was promised to Arthur’s brother, Henry. Less than a year after Arthur’s death, she lost the one person at court who cared enough to really help her. Elizabeth of York, Arthur’s mother, died trying to give her husband another son. Then Katherine’s own mother died. Her death hit her young daughter hard – not only because she lost a mother she loved, but also because her mother’s death lessened her importance in the royal marrying stakes. For years, she became a pawn for her father and Henry VII to squabble over. Sometimes a wanted pawn, most often not. By time of Henry VII’s death all she wanted was to come home and be allowed to take the veil. But his death meant a new King: Henry VIII: a youth of not yet eighteen. One of his first acts as England’s uncrowned King was to marry his brother’s widow. And not just because he thought it right to do. Before almost yearly childbearing in the first seven years of marriage, usually followed by grief for another dead baby, dragged her down and thickened her body, Katherine was a very pretty woman, very tiny, possessing beautiful red/gold hair. Except for Anne Boleyn, Henry always liked his women so. But twenty or so years later, five or six dead babies and only one girl for his heir made the King decide his marriage to Katherine was cursed by God and indeed no marriage. Not surprisingly, Katherine didn’t agree. Her first marriage was to a boy; she vowed she came to Henry virgin, untouched by man. She loved Henry. She believed in him. To her dying day, she blamed their separation on those surrounding him. Katherine loved God with all the passion of her Spanish heredity. The many trials she suffered in life only served to make this love stronger. She believed that “We never come to the kingdom of Heaven but by troubles.” With all her troubles, this belief must have been an almost daily mantra. Love and duty her life’s lodestars, such was her character the ordinary people of England always loved her. They took her to hearts when she first came to their shores: a lonely girl, exiled forever from the land of her birth. A girl well taught to do her duty. She did that and more, but her duty always went first to God. Katherine lived her life with great courage and resolution. Garrett Mattingly, her best-known biographer, called her granite shaping the final course of the stream. 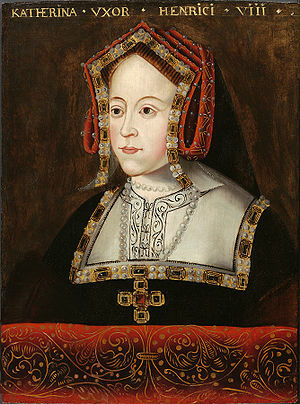 Katherine of Aragon tried hard to fight her husband’s desire for divorce by intelligent argument and staying true to her conscience – only to discover at the end her earthly war lost. Still – victory comes in many guises. When she died, she only regretted the lack of her husband and daughter at her side. She closed her eyes and breathed her last knowing God took her to Him. Henry VIII may have claimed her only as his brother’s wife at her death, but for all time England’s heart remembers her as one of its most beloved queens. Even now, people will find fresh flowers adorning her tomb in the beautiful Cathedral of Saint Petersburg. Katherine’s love changed history forever.